The Hohenlohe-Gymnasium Öhringen (HGÖ) school and MS Motorservice International GmbH cultivate a close collaboration with the aim of giving students a better insight into the day-to-day working life of industrial companies. 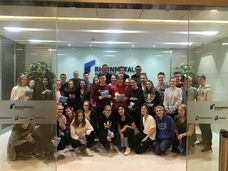 On 26 October, 30 students from HGÖ visited Motorservice’s Chinese company site in Shanghai. They came to China for a two-week school exchange with Huzhou High School. 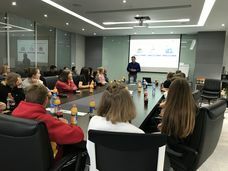 Accompanied by two teachers from both HGÖ and Huzhou-High-School, as well as an interpreter, the students arrived at MS Motorservice Asia Pacific Co., Ltd. on the afternoon of 26 October. They were welcomed by Hans-Peter Türk, managing director of the Motorservice subsidiary, and by Ulrich Schrameyer, training officer at Motorservice. Schrameyer was the person who started the cooperation with the school in Germany. It is based on a long-term cooperation concept, the measures of which are supposed to help students to develop a realistic image of the working conditions and qualification requirements in industrial companies. “With this, we want to make the entry into working life easier for young people. A look at our Chinese subsidiary will also expand their horizons,” explained Schrameyer during the event. After a tour and a company presentation from Hans-Peter Türk, a lively panel took place on current issues such as electric mobility, the automotive industry in China, the aftermarket and alternative mobility approaches. The students also learnt useful facts about living conditions, culture and work in China. Here Türk and Schrameyer answered numerous questions from the interested students from Germany. The student exchange between Hohenlohe-Gymnasium and Huzhou-High-School has taken place annually since 2007. In July, 30 Chinese students were in Öhringen for a week, staying with guest families. They visited the Motorservice headquarters in Neuenstadt am Kocher together with the students from HGÖ who are now in China. The current event starts another successful chapter in the cooperation between HGÖ and Motorservice.